During the years 1919 into 1925 Frank Lloyd Wright worked on four houses and a kindergarten located in metropolitan Los Angeles using concrete blocks as the main building material. The construction system has been described by Wright and others as ’uniquely molded’, ’woven like a textile fabric’ and perceived as ground breaking, truly modern, unprecedented. Many have attempted to uphold these claims while some thought the house-designs borrowed from old exotic buildings. For the first time this book brings together Wright’s declarations, the support of upholders and inferences in order to determine their accuracy and correctness, or the possibility of feigned or fictional stories. 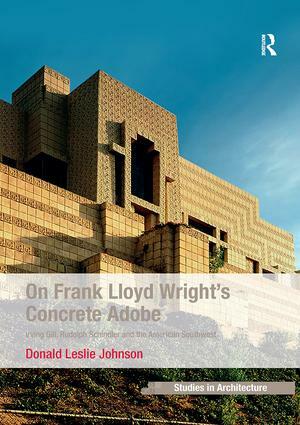 It examines technical developments of concrete blocks by Wright and others before his experiences in Los Angeles began in 1919. It also studies the manner of Wright’s design process by an examination of relevant pictorial and textual documents. A unique, in-depth and critical analysis of the houses is set within historical, biographical and theoretical contexts. Consequently, the book explains the impact upon Wright of California contemporaries, architects Irving Gill and Rudolph Schindler, and their instrumentally profound role upon the course of modernism 1907-1923. In doing so, it allows a full appreciation of Wright’s, Gill’s and Schindler’s buildings beyond their experiential qualities. Contents: Preface; introduction; Questions, events … and precast concrete; The buildings; The Taylors and the Griffins; Tiles and blocks; Wright’s fiction; Historians’ fiction; Irving Gill, regionalism and concrete adobe; Closure … Schindler and resurgence; Appendices; References; Index.